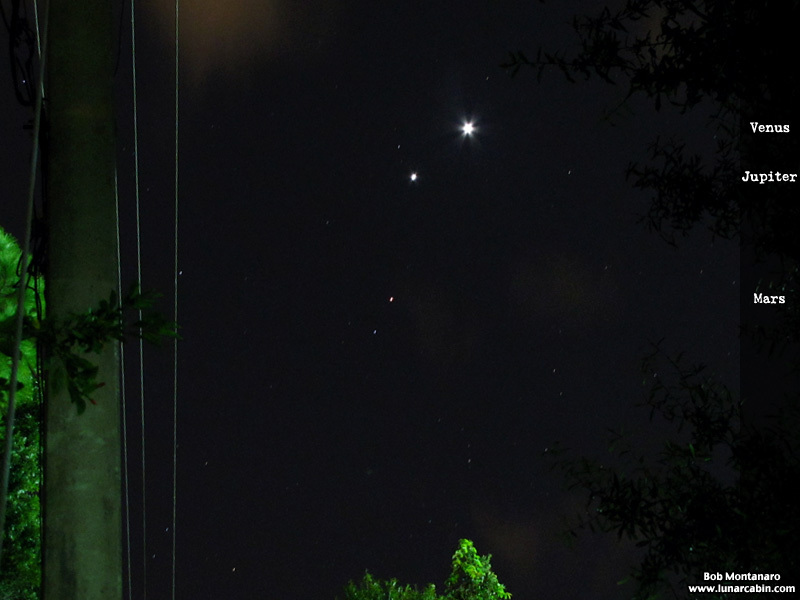 The planets Venus, Jupiter, and Mars move in the sky as seen from the backyard over 18 predawn photo sessions. 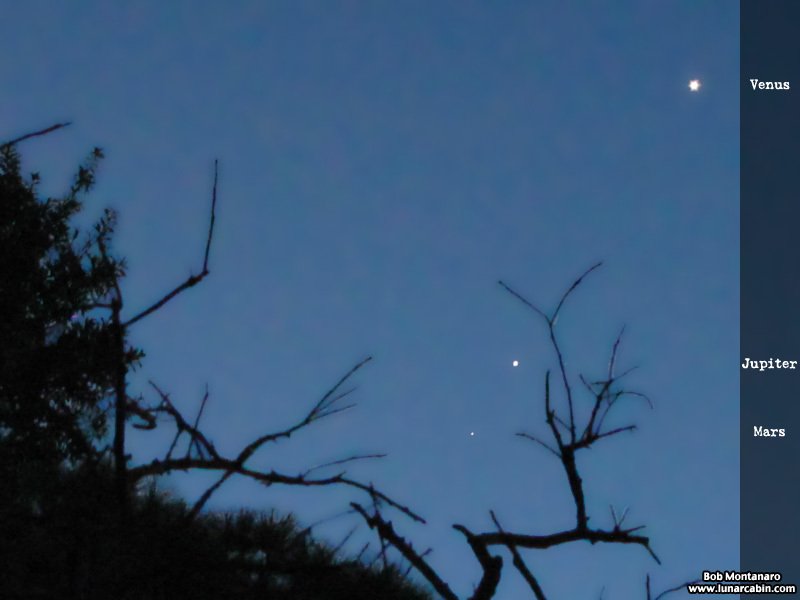 This is called a conjunction when planets appear to be close together in the sky but it is really an illusion of our Earth-based viewpoint given the vast distances between the worlds. 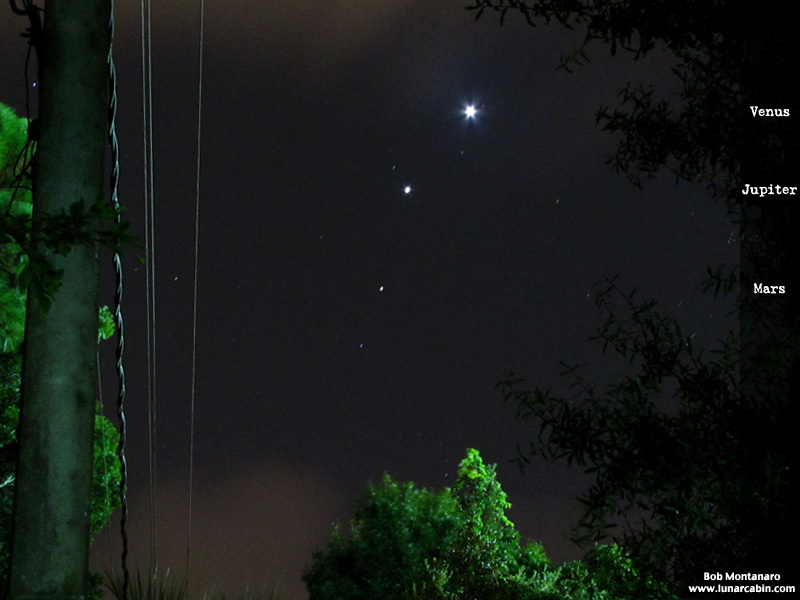 20 October 2015 – The planets are about to disappear into the brightening dawn sky. I would have to get up an hour earlier to catch the planets in a dark sky. Of course, the next day I got up early to find the sky clouded out. 22 October 2015 – A very clear morning to get bleary eyed out of bed to start the project. 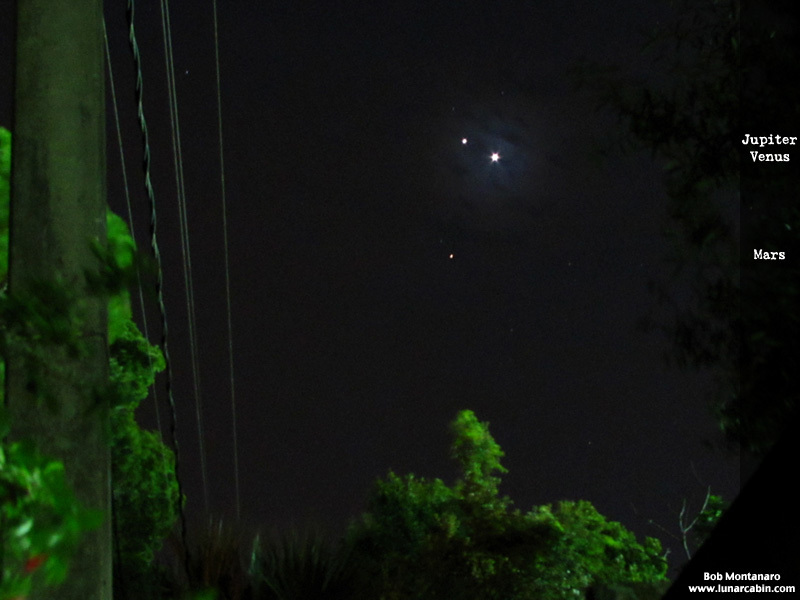 23 October 2015 – More clouds but the planets were easily visible. 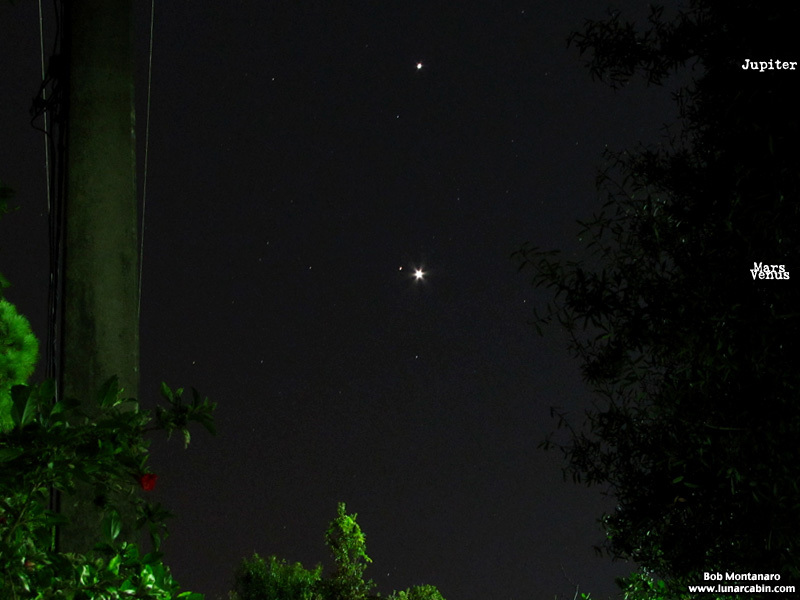 24 October 2015 – The planets are moving closer together. 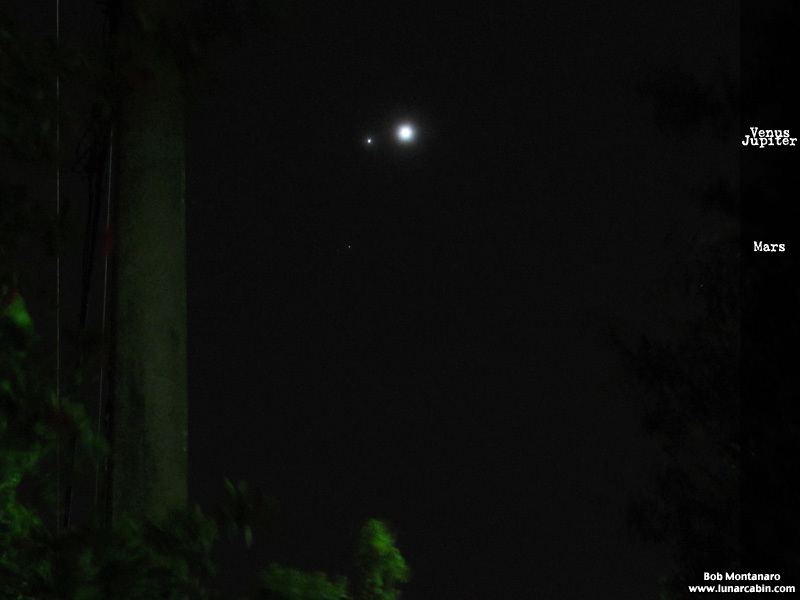 25 October 2015 – Very hazy as Venus and Jupiter pass each other. 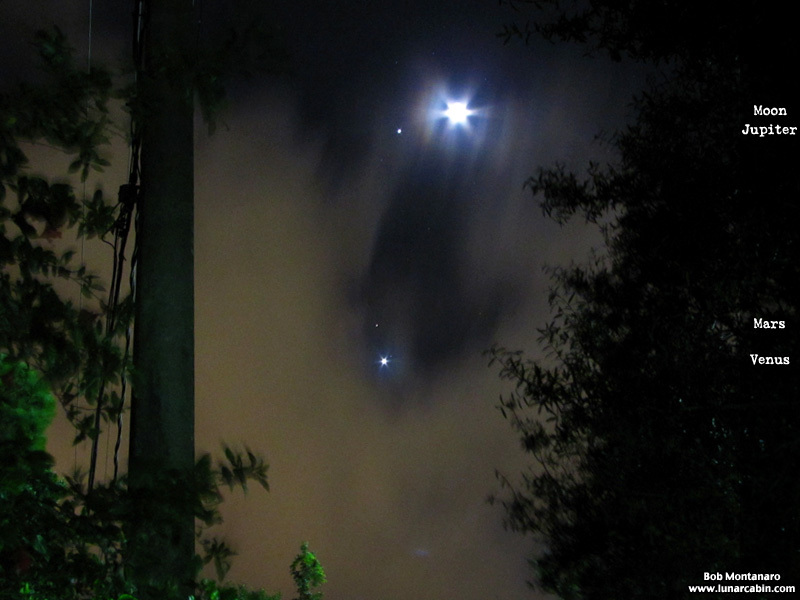 26 October 2015 – More haze around Venus and Jupiter, which is pulling up higher leaving Venus behind. 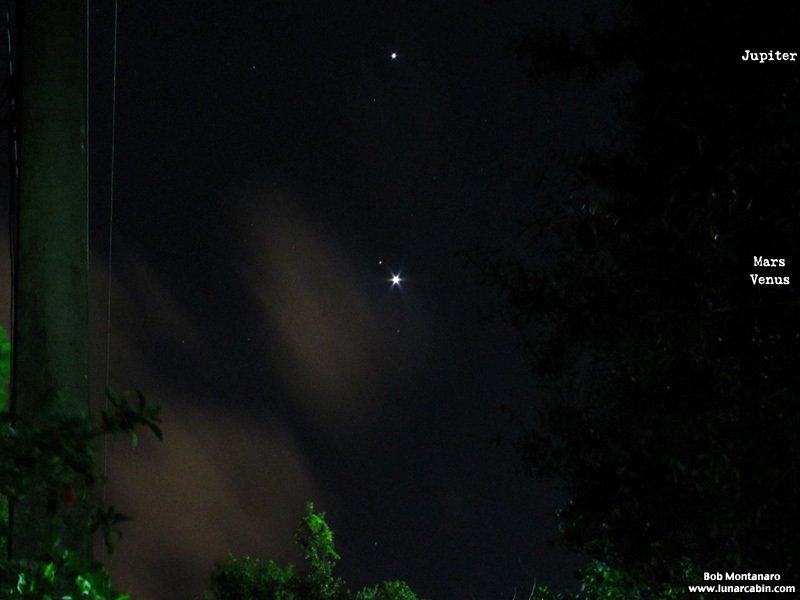 28 October 2015 – The 27th was clouded out and the 28th was almost a bust as well but luckily the cloud deck was thin enough to see the bright planets. 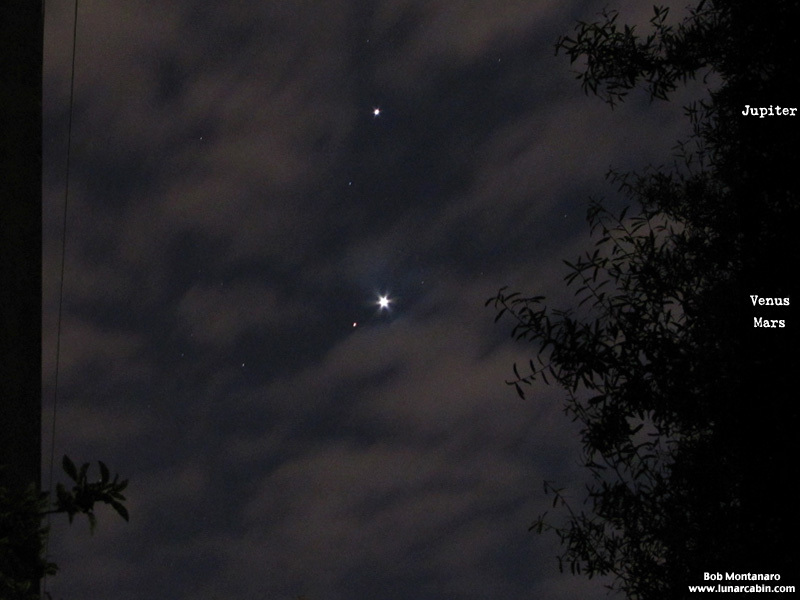 30 October 2015 – The 29th was also clouded out with conditions about the same as the 28th but with Mars lost in the murk this time around. 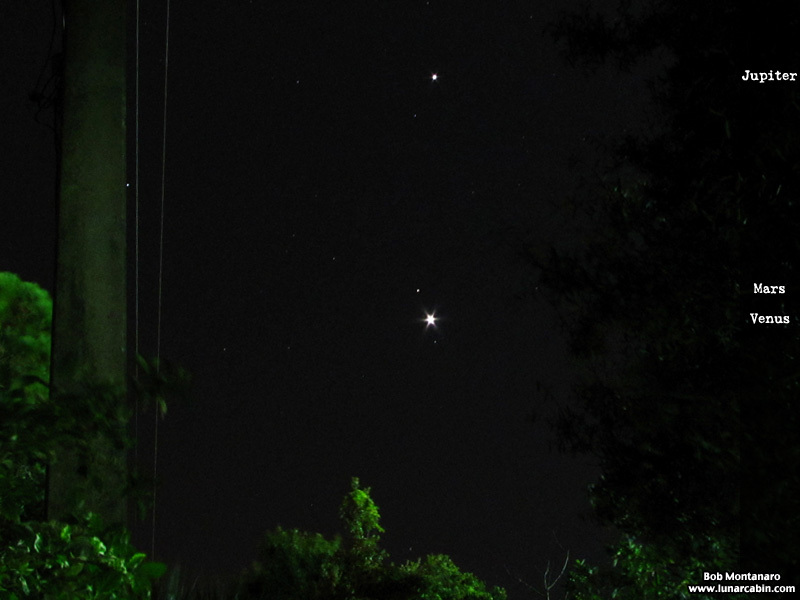 31 October 2015 – Halloween before dawn was clear affording a great view of where the planets were this morning with Jupiter clearly separating from the pack. 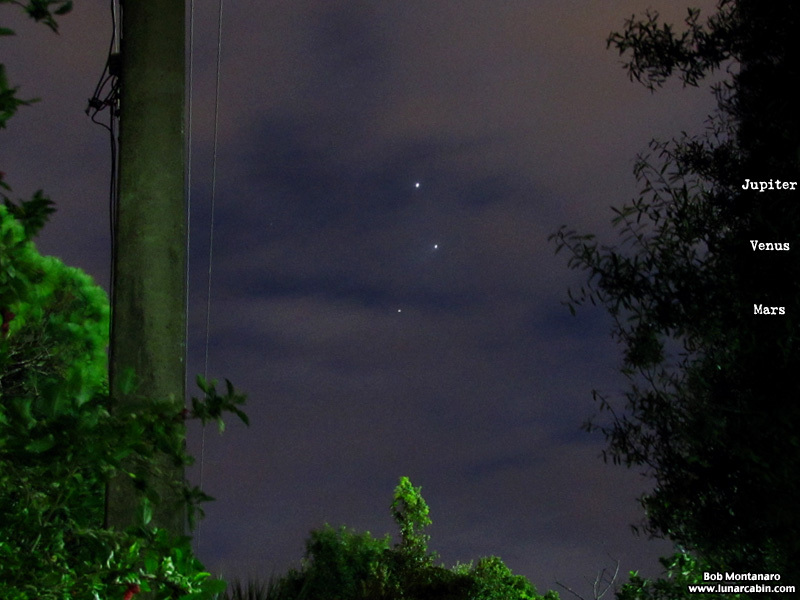 1 November 2015 – More clouds as Mars and Venus move closer together. 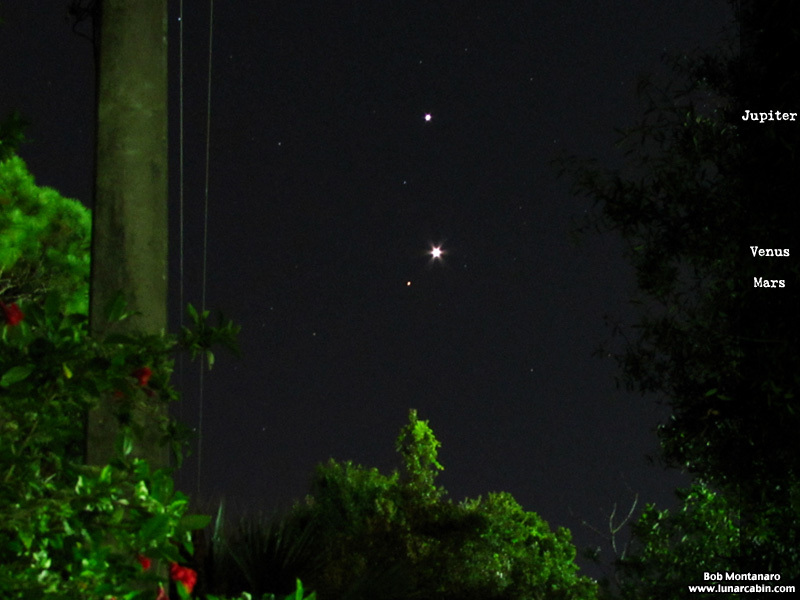 2 November 2015 – Was barely able to see the planets in the brightening dawn as the time change put me closer to sunrise. Would have to get up even earlier to compensate. 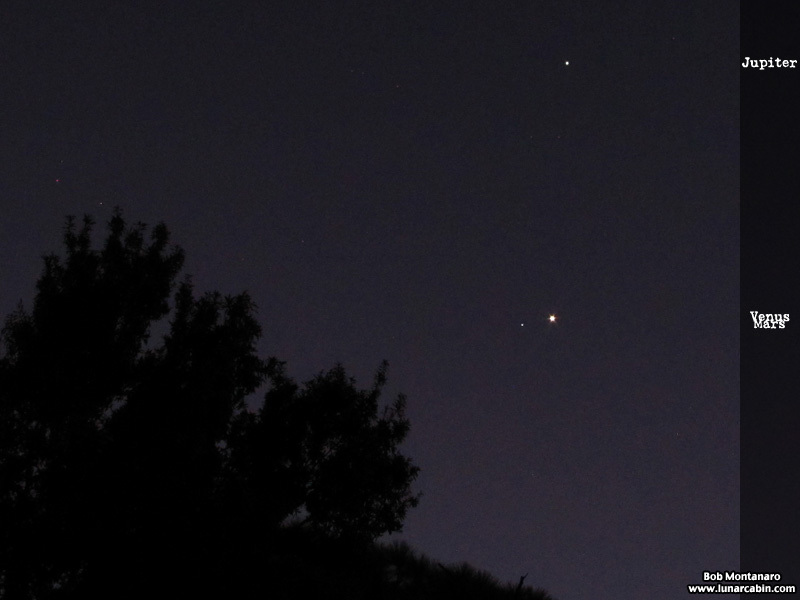 3 November 2015 – Mars passes Venus. 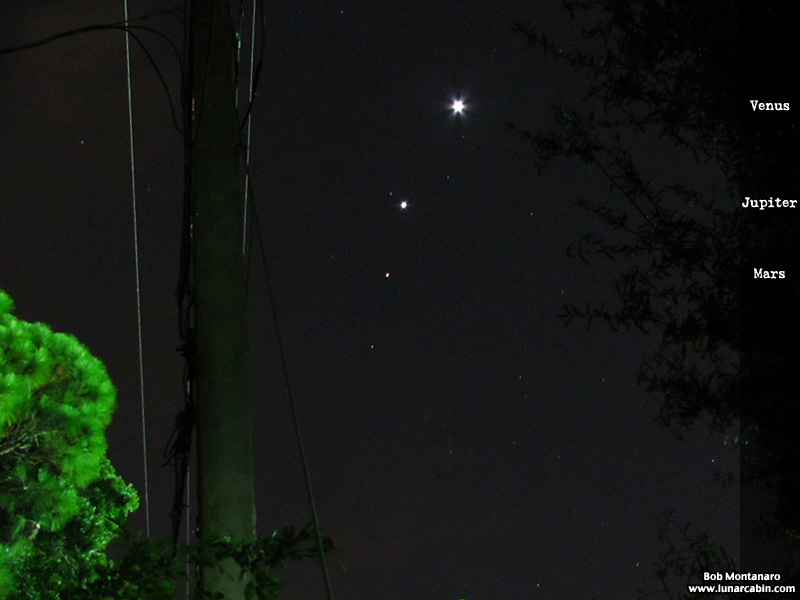 4 November 2015 – Mars gains altitude over Venus. 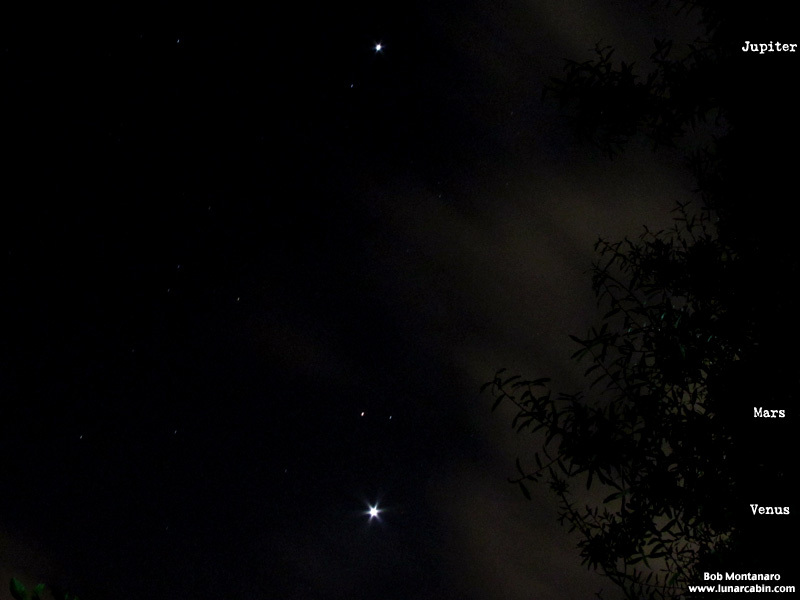 5 November 2015 – Mars’ apparent movement slows a bit compared with Jupiter. 6 November 2015 – A long wait while clouds moved through to get this shot showing a bright interloper, the Moon, getting into the mix. 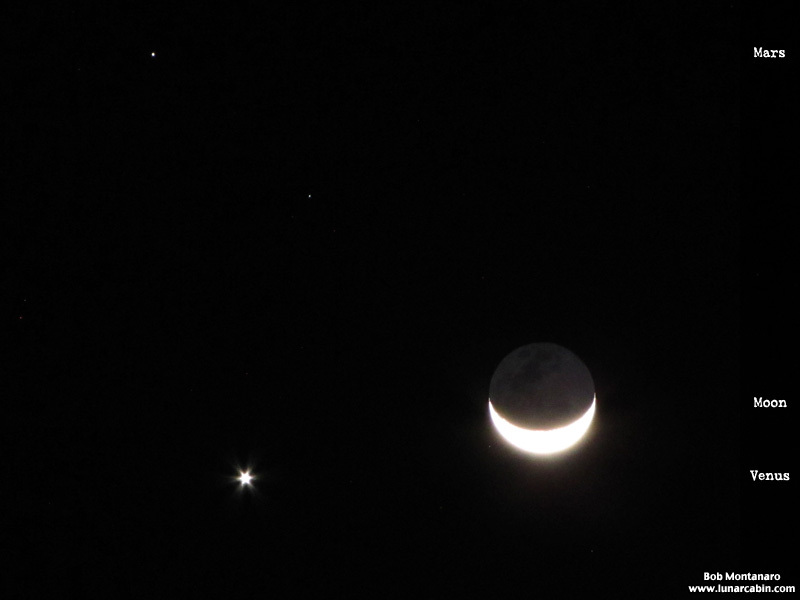 7 November 2015 – In one day the Moon has moved from being near Jupiter to the vicinity of Venus. 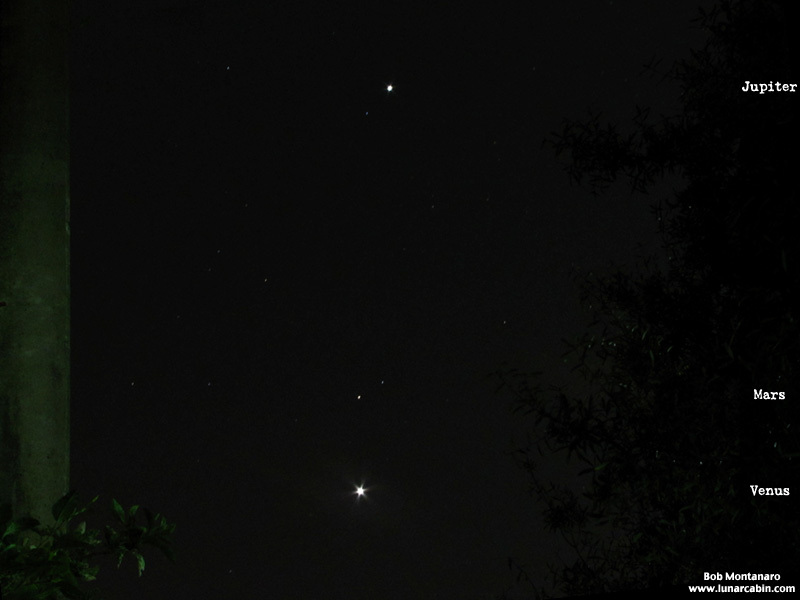 7 November 2015 – A closer image of the Moon, Mars, and Venus. The overexposed day lit region of the Moon is in sharp contrast to the grayish area of the Moon lit by Earthshine, the reflected light from the Earth. 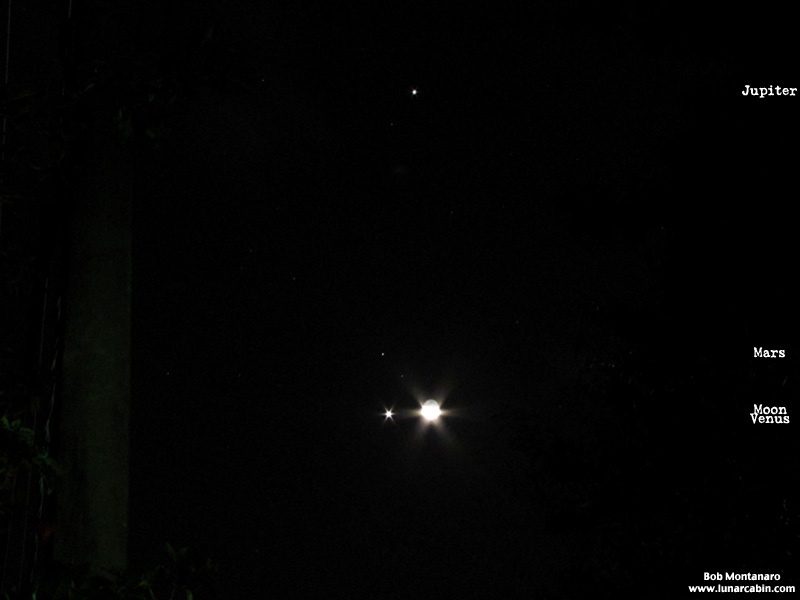 8 November 2015 – The Moon is gone and the planets continue their apparent separation from each other. 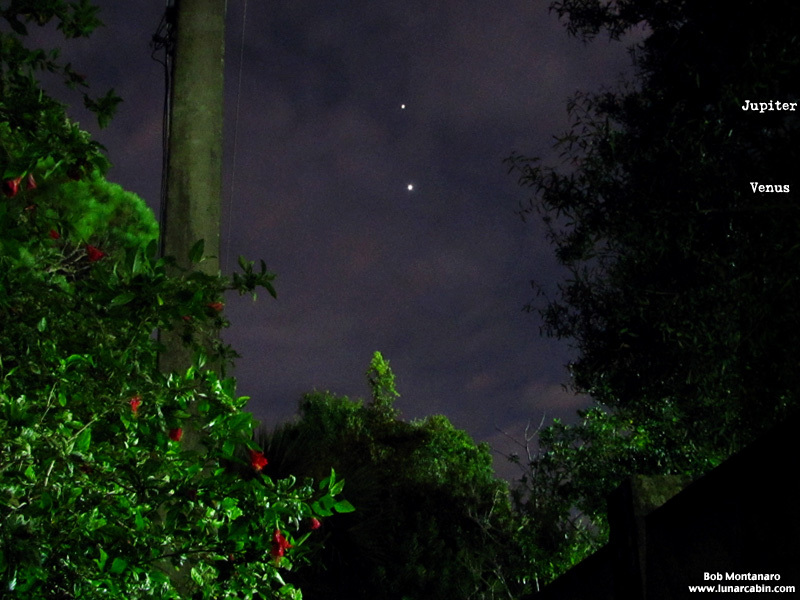 9 November 2015 – Sleep calls as the widening distance between the planets makes photography a bit more problematical so I called it quits at this point to enjoy a more civilized wakeup time.